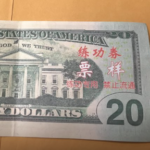 FINNEY COUNTY — Law enforcement authorities are investigating more fake money in southwest Kansas. 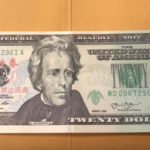 According to the Finney County Sheriff, deputies found denominations of $100, $50, $20, $10, $5, and $1 bills. The sheriff’s department reported the bills were obviously not real money and did not feel real. Authorities discovered that the money was made in China for training purposes for their financial world, and are available on the internet for purchase. On the left side of each bill are Chinese symbols in red and white, in the upper right hand corner of each bill are black hash marks. 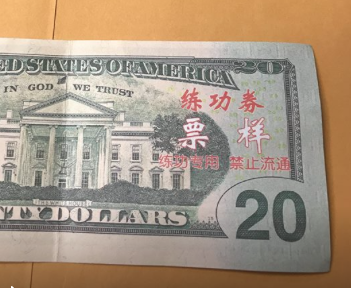 On the back of each bill on the right side, are more Chinese symbols in red and white lettering. 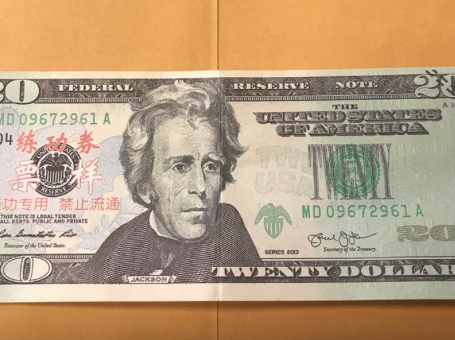 The sheriff urged residents to check your money closely and make sure you are not giving by accident or receiving any of these fake bills.